The FlexiDomeVF and FlexiDomeXT+ series of dome cameras are an excellent solution for virtually any indoor or outdoor application. The cast aluminium housing, polycarbonate dome and hardened inner liner of the FlexiDomeXT+ version can withstand the equivalent of 120 lbs of force. The FlexiDomeVF utilizes a standard indoor enclosure. These units contain full featured colour cameras with 1/3-inch CCD and integral varifocal lenses. VDC-455V09-10 Vandal Resistant Colour Model. 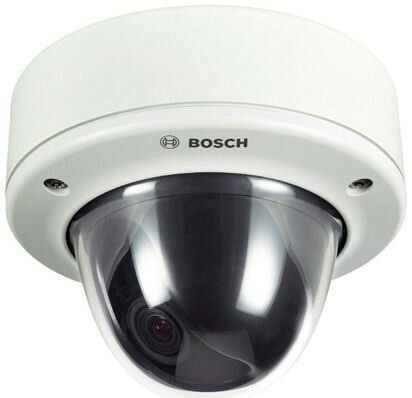 1/3-inch, PAL colour, 540 TVL, 12 VDC/24 VAC, 50 Hz, w/9‑22 mm F1.4 Varifocal lens, white.